There may be nothing more important to a veterinary radiologist than developing visual skills in order to make determinations about a medical issue an animal may have. To teach veterinary students how to hone their visual skills, Dr. Rachel Moon, an assistant clinical professor of radiology in the Department of Clinical Sciences in Auburn University’s College of Veterinary Medicine, partnered with the university’s Jule Collins Smith Museum of Fine Art to bring art and science into focus. 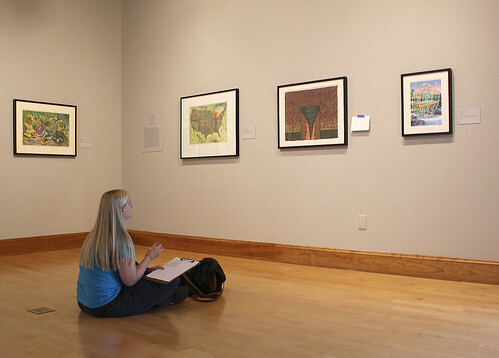 Students volunteered recently to spend a Saturday morning at the museum, examining works of art on display. They were asked to spend time observing selected pieces of art, objectively describe the visual details they saw in each and use these details to interpret the artwork. Once students practiced visual exam skills, they, along with Dr. Moon and Scott Bishop, curator of academic and public programs at the museum, went into a classroom to discuss their findings and their interpretations. At the end of the session, students applied that newly developed skill set to examine radiographs and other diagnostic images, applying what they could see, the objective visual details, to interpret the images. “Interpretation is based on our actual experience,” Dr. Moon said. “There can be a lot of different interpretations based on a central theme. “Radiology,” Dr. Moon said, “is an integrated process between the art and the science of discovery. The answer [to a medical problem] is not always apparent, so it is important that students can first describe what they are seeing before jumping to possible answers. Veterinary students can sometimes find radiology courses stressful, because students have to employ critical examination skills. But radiology is not alone. “These skills can be used broadly in a number of physical diagnosis situations for veterinarians, including dermatology and ophthalmology,” she said. Dr. Moon said the partnership with the museum has been perfect, “because art has no bias, it’s new to the students and it’s non-threatening. “In a classroom setting, students are relying on typical biases, but in a museum, they must rely on their skills of observation to make interpretations. “When veterinary students are in the clinical setting, there is a lot at stake, and they can feel the pressure. Will they get the diagnosis right, will the client accept the diagnosis?” Dr. Moon said. Bishop agrees. “People might think that museums are not for them, that the activity of looking at art is an elite one. 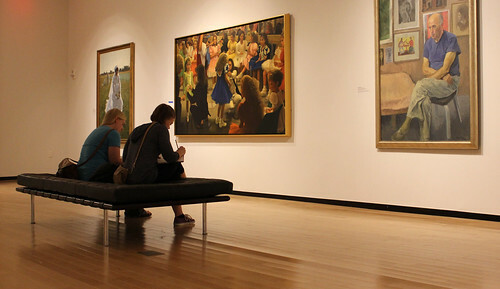 As an academic museum, we are committed to making art accessible to everyone. We especially want our students to be empowered to look at art, understand it, and feel its relevance in their lives. “It’s easy to look at a painting and say, ‘the girl is wearing a green dress’ but then they must also examine her face and say ‘is she worried?’” Bishop said. “Distinguishing that is the difference between observation and interpretation. Dr. Moon said when the students begin looking at works of art, they will count people and buildings and animals, and describe them in detail. As the sessions progress, the students make conclusions based on what they see. “Their observations and interpretations of the paintings, once they examine them, is exactly the same process that they need to go through when they look at a radiograph. Auburn fourth-year veterinary radiology students Taylour Seo and Freelie Mitchell examine art at the university’s Jule Collins Smith Museum of Fine Art to hone their visual skills. 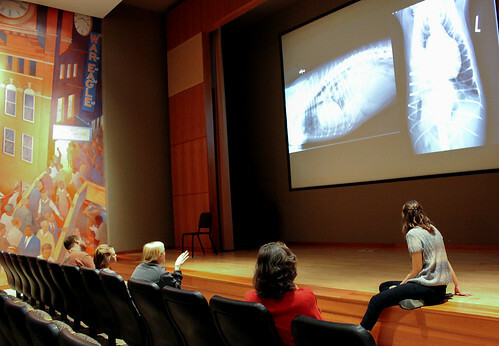 Auburn veterinary radiology students recently visited the university’s Jule Collins Smith Museum of Fine Art as part of a project to hone their visual skills. Auburn fourth-year veterinary radiology student Taylour Seo examines art at the university’s Jule Collins Smith Museum of Fine Art as part of a project to hone students’ visual skills. The Jule Collins Smith Museum of Fine Art will hold its biennial Creative Scholarship Showcase displaying the creative work of Auburn faculty and staff Sept. 28-Oct. 14. The multidisciplinary exhibition will feature fine art, applied art and design, performing arts, creative writing and other work from 22 departments across eight colleges. An opening reception is set for Sept. 28 from 5-7 p.m. at the museum.